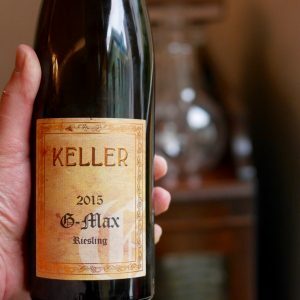 Justifying $1,200 for the epic Keller G-Max Riesling is a tough call for most. Luckily the Keller’s produce a superb range of dry and off-dry Rieslings from their Rheinhessen vineyards at more affordable prices! Getting a last minute phone call to attend a tasting of Germany Rieslings, saw me running through the rain, arriving late to a room full of wine lovers engrossed in a set of glasses filled with what turned out to be Rhienhessen’s nectar from the gods! Amongst the wines were a flight of wines from Keller. A name I’d heard a lot about, but, never, tried. Four dry and one Kabinett (fresh off-dry style). As I tasted through the bar just kept getting raised wine after wine. Then it happened, the G-Max! The G-Max is one of those wines that makes your heart race. I don’t believe in wine scores for the consumer, they lack context, ability to meaningfully relay quality to the consumer, and, fail to effectively differentiate that quality. I’d simply rate this wine as perfect. The room literally went quiet as I drank it. That’s happened on but a few occasions before. I think somehow my sense of smell, taste, and touch were so overwhelmed that sound wasn’t being processed! Sounds like crap, but, it’s the best explanation I have. The room literally went quiet as I drank it. That’s happened on but a few occasions before. I think somehow my sense of smell, taste, and touch were so overwhelmed that sound wasn’t being processed! Sounds like crap, but, it’s the best explanation I have. It’s with great pleasure that we offer a range of Keller’s wines to you today. Having trouble getting your head around German Riesling check out this post by Wine Folly “Understanding German Riesling” They’ve done a solid job in explaining the German style and quality system. There are a couple of vagaries when they talk about VDP (“Verband deutscher Prädikatsweingüter”). Don’t worry too much about those just recognise that as you move up the ladder things get tastier! Weingut Keller and its inspired head, Klaus-Peter Keller, are amongst the very finest estates in all of Germany. It’s interesting that Klaus-Peter trained with Hubert and Romain Ligner, and, Eric Rousseau in Burgundy. The parallels between the domains are worth considering. Meticulous care of the vineyards, low yields, wines of great harmony and texture. It’s the last, texture that has always fascinated me as a winemaker. It’s the one that often separates the great wines of Europe from their Australian counter parts, and, the one I was heavily focused on refining at Yarra Yering. Keller has been in the family since 1789. Thier 18ha holding consists of 15ha of Grand Cru sites. The Limestone and Von der Fels Rieslings are blessed to incorporate GG fruit! Since taking the reigns in 2001 Klaus-Peter has gradually increased the proportion of dry Riesling produced by the estate, and, it is these wines that have brought critical acclaim. I’ve not had the fortune to meet Keller. When you read from those who have it’s clear that Klaus-Peter has the kind of detailed approach that is common to many of the great estates of the world. John Gilman gave a fascinating insight into Weingut Klaus-Better Keller for the 2006 release in his critical and historical commentary “Weingut Klaus-Peter Keller- Germany’s Answer to Clos Ste. Hune.” It shares the deep thinking and detailed approach Keller takes in both vineyard and winery. It’s safe to say that since it’s writing Keller’s wines have continued to go from strength to strength. The following passages are from Gilman’s commentary. 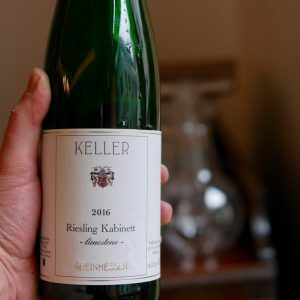 Weingut Keller is actually one of the latest riesling harvesters in all of the Rheinhessen, with the Grosses Gewächs sections of their vineyards often brought in the first few weeks of November! And yet these are not high alcohol and burly wines, as the potential alcohol of the dry wines is normally no more than 12.8 to 13.2 percent (which is significantly below what most top growers in the Wachau are attaining these days for their rieslings). To achieve this the Kellers take active steps to slow the vegetative cycle of the vine during the course of the growing season. First of all, they choose low-yielding clones for their new plantations, typically which have small bunches of small berries, and which usually come from cuttings of their best old vines or those of their winemaking friends. With the older vines, and the Kellers do have plenty of these, there is less need, as nature serves as an active limit on yields. However, Klaus-Peter and the rest of the Keller vineyard team take active measures to slow down the ripening process during the course of the summer, which includes pulling a couple of leafs per grape shoot on each vine at regular intervals starting in early June to slow down the plant’s photosynthesis, pruning the vines to keep the grapes nicely shaded through much of the growing season (to keep the grapes from getting sunburned during their prolonged hangtime) and keeping good spacing between bunches to aid air flow and retard botrytis (and other forms of rot) forming in the Riesling bunches targeted for making dry wines. This is a viticultural methodology that should be studied and emulated in many more wine regions in the world that today are struggling in vain to produce world class wines with excessive ripeness and dizzying sugar levels. In the cellars Klaus-Peter has made a few changes as well from his father’s time, but the vast majority of the focus continues to be on the vineyard work. The white wines now (particularly the Rieslings) are fermented more in old oak fuder, rather than in stainless steel tanks than was the case for his father, and indigenous yeasts are relied upon whenever possible for the fermentations. The one relatively novel approach that Klaus-Peter has adopted for many of his white wines is to allow the grapes to macerate on their skins for thirty or forty hours prior to pressing them and running off the juice to fuder for fermentation. This is a bit of a risky maneuver that requires perfectly pristine fruit, and so selection in the vineyard and at the winery before the grapes go to the press is a fundamental tenet of the Keller philosophy. The basic bottlings of the white wines are fermented at slightly lower temperatures than the Grosses Gewächs, and they are bottled earlier as well. The riesling Grosses Gewächs and the G-Max bottling (Klaus-Peter’s top, old vine dry riesling cuvée) are allowed to rest on their fine lees until March after the harvest, prior to being prepared for bottling, which is done with a very light filtration. Additionally, some of the cuvées are also held back in bottle an additional six months prior to being released to allow the wines to fully harmonize. Finding the balance of physiological (flavour and tannin) and sugar ripeness in the vineyard, without compromising freshness, has been the key to achieving greatness across the wine world. Where in the World are Keller’s Wines Made? Keller’s home is in Flörsheim-Dalsheims lies on the rolling hills on the Rheinhessen-Rheinpfalz border, in the area of the Rheinhessen known as the Hügelland, centered around the towns of Flörsheim-Dalsheim and Westhofen. Here the soils are dramatically different from those that lie along the river, with many of the best lying on outcroppings of chalky marl, which recall the Trimbach family’s great Clos Ste. Hune more than they do the slate of the Mosel. In this, southern part of the Rheinhessen, all of Keller’s GG vineyards rest within 10km of their home. This area of Germany is home to their great wine regions. 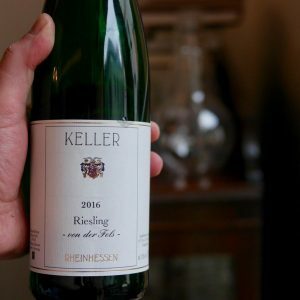 Keller’s entry-level Grüner-Silvaner from old vines tastes as good as you would expect: delicate notes of hay, rich in extract, bone dry – a wine that encourages you to drink. Steel and stones, dried flowers, lemon rind, faint honeycomb to sniff on. Doesn’t reveal much, but sets you up for ‘mouthwatering’ times. Pavlovian. It clatters along the palate in that crisp, mineral-water-with-squeeze-of-lime way, shudders on chalky fringes then pools in the back palate with sweet citrus deliciousness. It’s all slate and granite tinged, shows a lick of herbs, citrussy and fine along its long line. It’s delicious. Cracking drink for the coin. Vibrant refreshing, a little edge of phenolic texture, zesty and pithy. It's carrying an edge of spritz, that quickly dissipates to find the right balance in the glass. The perfect hint of bitterness, a silver lining providing a lovely clean finish. Sourced from the younger plots of the prized ‘First Growth’ Abtserde & Kirschspiel vineyards which were deemed to be “just perfect” for Tocken (dry wine). And as with the Limestone Kabinett, this is only made in exceptional years when the fruit is deemed worthy by Klaus Peter. Not to be confused with the Keller Riesling Limestone Kabinett. That tension between sweetness and acidity always seems to be so nicely judged in this wine, and no change here. Perfumed, juicy stonefruit and sweet green apple, light chalkiness, refreshing ‘just so’ acidity, with a subtle quinine bitterness on the finish providing a fond tweak of farewell. Hard not to race through a glass, and would be great with the right kind of Asian food. It's great to see this Trocken (dry) side by side with the Kabinett (off-dry), from the same fruit source. It offers the opportunity, to see both styles, how good they both can be. This dry version can still have up to 9g/L sugar. At the end of the day it's not about the numbers. The big question is, have they made a beautifully balanced, delicious wine. The answer, definitively yes. The juicy acid, has the depth of fruit to back. Sourced from the younger plots of the prized ‘First Growth’ Abtserde & Kirschspiel vineyards which were deemed to be “just perfect” for Kabinett. And as with the Limestone, this is only made in exceptional years when the fruit is deemed worthy by Klaus Peter. 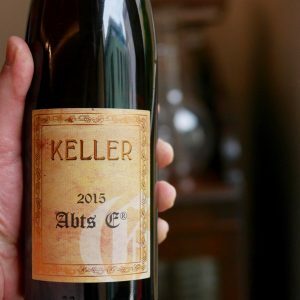 Displaying all the hallmarks of a Keller classic, it walks the tightrope balancing sweetness and acidity with aplomb. White blossom, dried herbs, concentrated citrus, orchard fruits and a talcy minerality. Energy, power, drive and persistence. Keller ist Keller. Amazing producer. Beautiful talc perfume, and maybe something like guava, ripe lime, rocks and candles, and, well, just other delightful Riesling stuff. Intense lime and green apple, chalky and slaty, good punch of crystalline acidity tussling with juicy sweetness, and an uplifting finish of perfume, precision and lip-smacking satisfaction. This is how you do a pow pow powerful off-dry Riesling. This is a demonstration of how to make sweet / off dry white wine. The incredible acidity that the Rheinhessen is capable of producing is the perfect base to work with to make pure off-dry Riesling. Keller have got this bang on. The right amount of vinosity to taste like proper wine and not grape juice, with a level of complexity that is a sign of the quality GG vineyards from which the fruit is sourced. It's a fun, vibrant and refreshing drink. Lovely citrus and floral notes. Von der Fels,’from the rocks’, is made using GG “cru” vines from 10 to 30 years old. 15 of Keller’s 18 hectares are classed growths. A peek at Grosses Gewaches complexity for a ludicrous price. About half of the production for this lovely bottling also hailed from the Kirchspiel vineyard, but from the chalky marl soils of the terres blanches section of the vineyard. The other half of the cuvée also comes from terres blanches soils, found in the lower sections of the other various grand cru vineyards: Hubacker, AbtsE and Morstein. One of the reasons that these lower slopes of these vineyards are not entitled to Grosses Gewächs status is that the soils here are deeper and richer, with more clay mixed in with the hard limestone. However, one would never realize this fact from the profile of the “Von der Fels” bottling, which is an intensely chalky, racy and minerally wine with a fine core of fruit and outstanding structural attributes. While much of the surging demand for Klaus-Peter’s wines focuses on the Grosses Gewächs bottlings of riesling, the outstanding quality of this regular bottlings of dry riesling demand that they not be ignored. This seems a more searing, intense and tightly wound wine than the more approachable (and highly gluggable) 2013. Pink grapefruit and lemon rind, pleasant whiff or mineral oil/petrol, almost an orange oil or tangerine perfume and subtle cheesiness. Pure and mouth-watering, distinct stony texture and flavour, racy citrus and tart green apple. Finish is almost wince-inducing, yet strangely pleasurable, and certainly long. This should be a mighty wine with a decade or so of bottle age. Has the lemon/grapefruit notes of the estate Riesling trocken but with a little more complexity of minerality, not quite smoky more dusty, in a Chablis-like way. So mouth-watering it is almost chewy, with plenty of extract. Lightly mineral on the palate too and with a long, fresh citrus tail. The favoured vineyard of the Bishop of Worms in the 14th century, today a sub-plot of the Brunnenhäuschen Grand Cru. The Kellers acquired their parcel in 1996 and own the oldest vines. Like Morstein, Abtserde ripens late, often in November. Very stony ground with little topsoil tends to produce sparse clusters of small berries. Beautiful minerality and finesse, dances over the palate. The vines that Klaus-Peter has in the AbtsE are impressive, as they produce very tiny berries because of chlorosis (a vine disease that causes early yellowing of the leaves) which further slows photosynthesis during the hot summer, and translates into a very racy, minerally and discreetly complex wine. The first Keller vintage of the AbtsE, the 2006, is an outstanding wine by any measure, but I have little doubt that it will be surpassed in quality by subsequent vintages from this great vineyard. Absolutely stunning, the depth and length of this wine are insane. Beautifully developed, the texture of this wine is something special. Such an intrigue perfume, maximum harmony and poise. A very rare special cuvée from the estate’s oldest vines, named in honour of Klaus-Peter’s great-grandfather Georg and his youngest son Max. From an undisclosed Grand Cru site. The vines for the G-Max bottling are all extremely old, and from which vineyard they hail from is no longer made public. Klaus-Peter may well make it from a different parcel of old vines in each vintage, probably at the very top of one of the slopes, depending on which parcel has excelled the most in any given year, but he is no longer at liberty to say from which vineyard he has made the wine. The reason for this is the year that the G-Max was made from the oldest parcel in Morstein, Klaus-Peter (who then saw no reason to keep this information private), told all of his visitors where he had sourced the grapes from for the G-Max, only to find one of his enthusiastic Japanese fans in the Morstein vineyard soon after cutting grapes from this parcel to take home as a souvenir! This is one of those wines that makes your heart race. I don't believe in wine scores for the consumer, they lack context, ability to meaningfully relay quality to the consumer, and, fail to effectively differentiate that quality. I'd simple rate this wine as perfect. The room literally went quiet as I drank it. That's happened on but a few occasions before. I think somehow my sense of smell, taste and touch were so overwhelmed that sound wasn't being processed! Sounds like crap, but, it's the best explanation I have. The very definition of poise and sophistication.